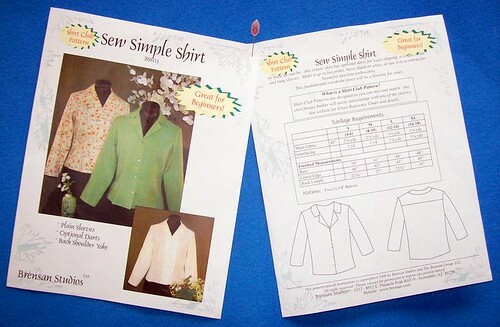 This is another version of the Brensan "Sew Simple Shirt"....this time with long sleeves, from a very soft, almost gauze-like novelty cotton fabric. The sleeves were made exactly per the pattern specifications, and are wide enough at the hemline to be able to roll up to elbow length. I plan to wear this blouse open over a white tank top, with jeans and white strappy sandals...for a breezy casual look. 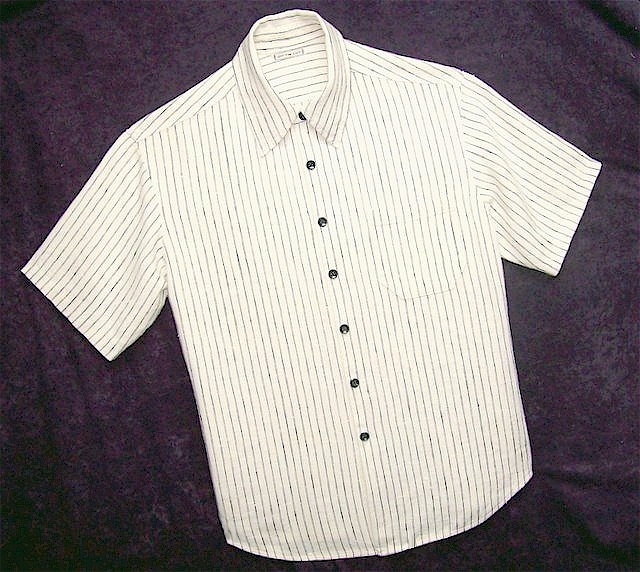 I have yet another shirt cut from this pattern, a long sleeve version with sleeve cuffs from a beautiful Swiss cotton shirting. Then I will tear myself away from this pattern and move on to other things. Next up are 2 tailored linen jackets among the many sewing projects I have planned for June. SEWING NOTES: I did make changes to this version of this blouse: I lengthened the collar by about 1/2" and did not sew the darts. Interfaced with ProSheer Elegance Fusible Interfacing from ~Fashion Sewing Supply~. Buttons from ~Fashion Sewing Supply~. When you say "lengthened the collar" - what do you mean? On the first version of this shirt, the collar appeared a little short...it was wide enough, it just didn't appear long enough (just purely my perception). So this time I split the collar pattern at CB and added 1/2". Now it extends along the neckline a little further...1/4" on each side. It's really fine as drafted, I just wanted to make a little change. Is the notch lower than it is on your first version? And when you plan to roll the sleeves, how do you do the seams -French seams? Flat-felled? This time I did flat fell seams. Because the fabric is so light I was able to just turn both seam allowances and stitch them down, without first trimming one of them. 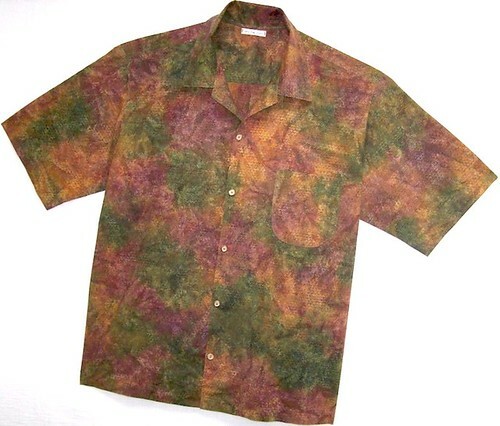 Made for a client, this menswear shirt is an original design. It is made from a beautiful linen from Gorgeous Fabrics that I distressed heavily. "Roughing up" fabrics is one of my favorite things to do. Usually I distress fabric before it is cut and sewn. This time I pre-washed the fabric just once in hot water and tossed it into a hot dryer to get the "shrink" out. Then I pressed the yardage lightly leaving some fine wrinkles, and cut and sewed the shirt. After it was complete, it went into the wash again, along with several tennis balls....going through several cycles in hot water. 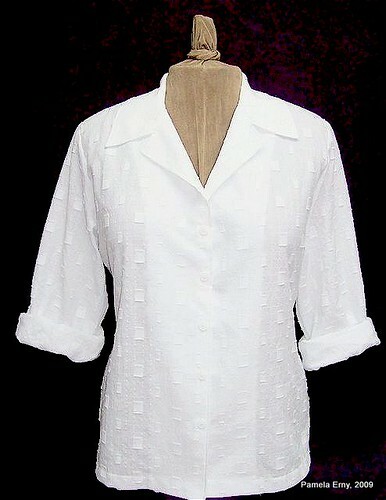 Then the shirt was dried in a hot dryer and the result was a soft linen shirt with lots of drape. The edges of the shirt, its design features, and felled seams are now slightly faded, highlighting them nicely. What looks like white lines on the shirt are actually tiny 16th-inch pin tucks...one on the bias near the right shoulder, another down the front of the shirt to the right of CF, and another pin tuck on the pocket, again on bias. The hem is straight :) The distressed linen is draping in soft folds. SEWING NOTES: Hand Drafted Pattern, interfaced with PRO-WEFT Fusible Interfacing from ~Fashion Sewing Supply~, Buttons from ~Fashion Sewing Supply~, Fabric from Gorgeous Fabrics. Made for a very special client, this shirt is an original design. Made from heavy silk dupioni, the fabric was washed once to pre-treat. 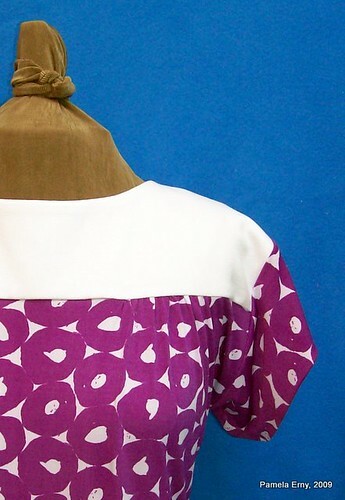 The pattern pieces were laid on the cross-grain of the fabric and the shirt was cut and stitched. It was then washed several more times in hot water. After a hot cycle in the dryer, the shirt was gloriously soft and the slubs raised irregularly. This gave the gave the garment the soft, slouchy look I wanted it to have. 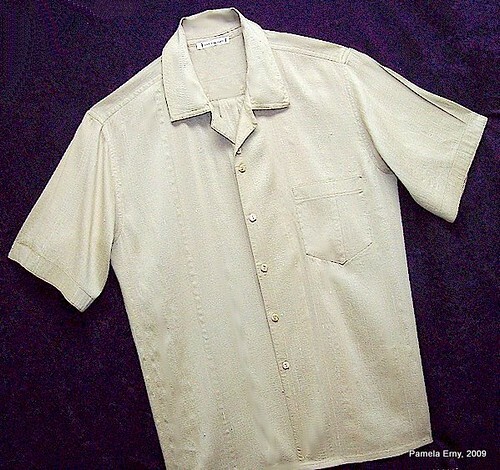 Design features include a vertical, flat felled Prince Seam (on the right side), banded Sleeves, double top Buttons, and a vertical flat-fell seamed Pocket with top band. ***For my method to make symmetrical pockets with a nice sharp point, check out my tutorial "Perfect Pockets Every Time"
Buttons from ~Fashion Sewing Supply~, Fabric from my stash. 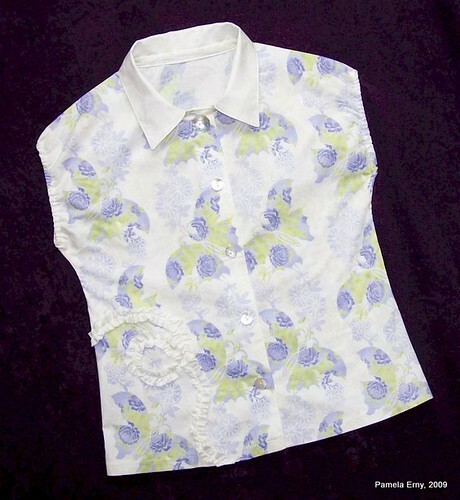 Eventually it will warm up here in upstate New York state, and my 10 yr old niece will be able to wear this sleeveless summer blouse. In the meantime, I think it will layer nicely worn open over a light t-shirt. I cut a 3/4" wide strip of fabric on the bias. The next step was to run a long stitch down the center of the entire length of the strip. 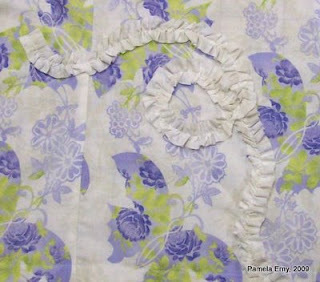 After gathering the strip to make a long raw-edge ruffle, I arranged it on the blouse in a random pattern. To secure the ruffle to the shirt, I stitched it down the center with narrow, short, zig-zag stitching. After pulling out the gathering threads, the ruffle embellishment was complete ! 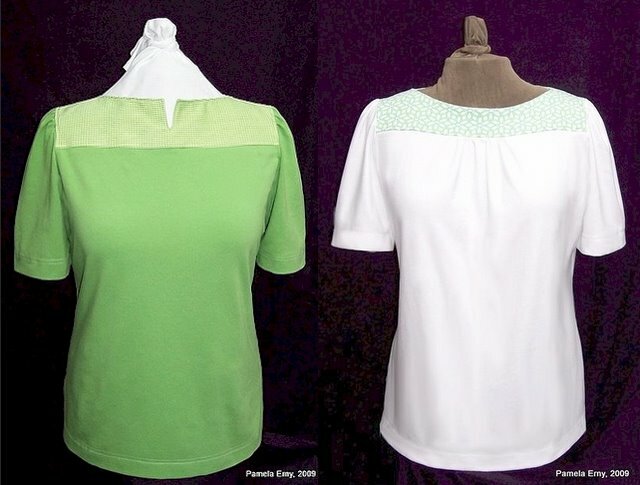 SEWING NOTES: Collar and Facings interfaced with PRO-SHEER ELEGANCE FUSIBLE Interfacing from ~Fashion Sewing Supply~ . Cotton Fabric from Fabric.com. Mother-of-Pearl Buttons from my stash. One of the things I like so much about Ottobre Design Patterns, is how easy it is to make liberal design changes to the basic style. This top made for my niece Bella, age 8, started with the Cross-over Top, from Ottobre Design Issue 03/04, pattern#9. 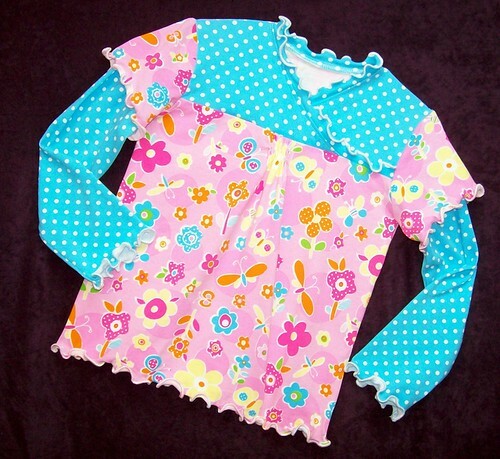 I modified it by adding center-front shirring, double sleeves...and lots of "lettuce" edging. I had such fun making this simple little top ! This outfit was made for my ten year old niece, Willow. She's been wearing it for a few weeks now....and probably will continue to wear it until it warms up around here. That may not be until mid June! 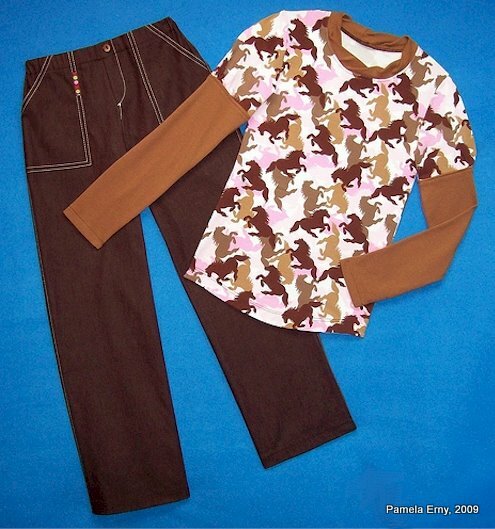 The "horse print" cotton knit fabric was so much fun to work with. Starting with Ottobre Design pattern 01/09, #34, I played with the sleeves, splitting the pattern and adding gathers to the top part. I then shaped the hem, and added twisted trim to the neckline. Ottobre Design Pants, 03/03, #23, made from Stretch Denim. Many have asked about the twisted neckline trim that I used on this top. I needed a fast-to-make "Camp Shirt" pattern...now I have one! The line drawing does not show the optional front and back darts. I continue to be impressed by Brensan Studios patterns. While this draft is very basic, it is very well executed with optional front and back "fish-eye" darts and nice side-seam shaping. Simple yes...very simple...but well suited to adding your own details. For instance, the sleeves just beg for cuffs. 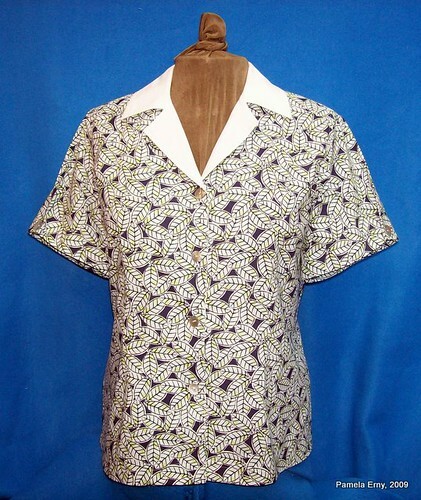 This version of the "Sew Simple" blouse was my test garment for this style. I'll be making it again in nicer fabric...this fabric was a cheap find (emphasis on the cheap)...but this shirt will be fine for everyday wear. You'll notice that the sleeves seem quite wide. That's because the pattern is drafted for long sleeves, and I decided to make short sleeves after the long ones were sewn. Hah! 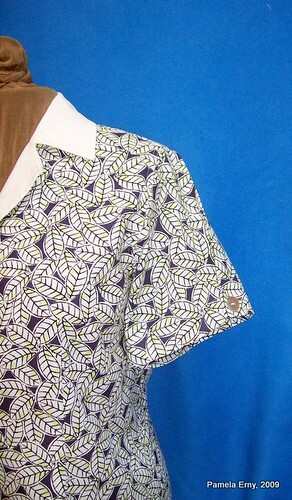 You should have seen me in this fabric with long sleeves...I looked like a little tree..one that needed pruning, fast! So in order to narrow the newly hacked-off sleeves, I "pinched" out an inch and formed pleats. Then I secured them with slightly larger sized M-O-P buttons than those used on the shirt front. On future garments, I'll narrow the sleeve and raise the cap slightly...easy pattern alterations. SEWING NOTES: In my opinion, when using cotton fabric for a style like this you need to affect the hand of the fabric as little as possible. I used PRO-SHEER ELEGANCE Fusible Interfacing from ~Fashion Sewing Supply~ because it is so exceptionally silky and soft. Fabric is from the close-out section at JoAnn Fabrics, Mother-of-Pearl Buttons are from my stash. The "verdict" on this style from HotPatterns is that it's a winner! But I must admit I had my doubts as I was tracing this pattern, because at first glance it looks like a collection of big rectangles. That is until I looked more closely to see the subtle shaping of the pieces. And it is this clever drafting that saves this top from being a "potato sack", like so many similar styles from the "Big 4" pattern companies. Again, Trudy has used her talents to give true fashion panache to a simple style. 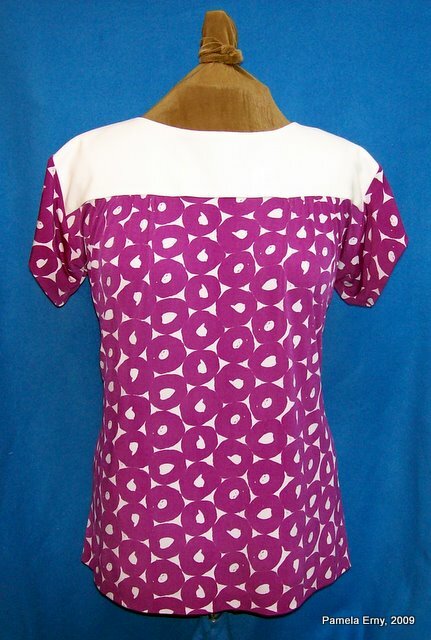 This pattern has many length, neckline, and sleeve variations. I chose to make the most simple variation...partly because I was using a bright busy print, and quite frankly I just wanted to sew something last night that would be quick to make! This photo shows the front bodice gather detail....that is hard to see in the first photograph. I look forward to using this pattern again to make the tie-front style..then I'll have yet another nice top to wear this season ! I have had this lovely striped linen in my "shirt fabric" stash for quite a while...it's a client favorite. This linen is of beautiful quality, quite thick, but very stiff right off the roll. So in order to make this soft drapey men's shirt...I first had to beat the living daylights out of the fabric! The linen went into a washing machine full of hot water and about 3 cups of plain vinegar. After running it through 3 complete wash cycles (resetting the machine before the water emptied), I rinsed it thoroughly in cold water. Then the fabric was tossed into the dryer set on high heat. The result was gloriously soft linen, with nicely raised slubs...waiting to be cut and sewn into this loose slouchy shirt. 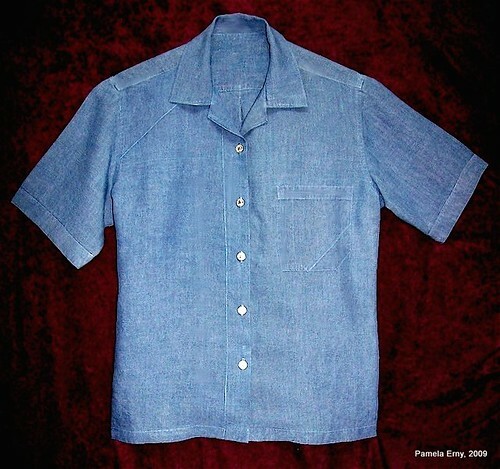 The style is of my own design and features a collar-on-stand, a French Fold front placket, an angled edge pocket, and a slightly curved hemline. Its slightly rumpled look is entirely intentional.